Canberra Porsche racer, Cameron Hill is aiming to carry momentum into this weekend’s final Carrera Cup round at the Vodafone Gold Coast 600… in more ways than one. 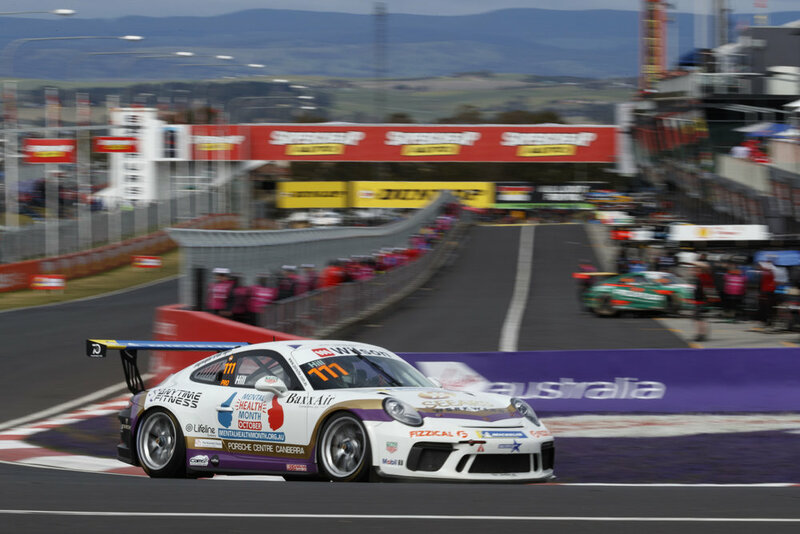 The 21-year-old scored his maiden podium finish in the previous Carrera Cup round at the Bathurst 1000, demonstrating the improvements he and his family team have made since the start of the season. But it was also a fruitful weekend off the track, with Hill’s Mental Health Month October campaign generating significant awareness for an illness that affects one in five Australians. Hill’s Porsche will once again be adorned with the distinctive livery this weekend. “The response to our drive for Mental Health Month October at Bathurst was tremendous – we had a lot of questions and comments from members of the public who were wandering through the Carrera Cup paddock over the race weekend,” Hill said. “On Saturday 13 October, our race car was on display for an open day at Porsche Centre Canberra; they held a simulator competition to raise money for Lifeline Canberra. On the track, Hill said his strong result at Bathurst gives him confidence for the Gold Coast. “At Bathurst, we genuinely had top-four pace in the dry – our car was a rocket in the Sunday race and I was challenging the leaders. “Like a lot of tracks on this year’s calendar, it will be my first time racing at the Surfers Paradise street circuit but I’m confident I can learn it quickly based on our performances at other tracks. “It’s a rough circuit with lots of bumps, kerbs and concrete walls – there’s not a lot of margin for error, and overtaking will be tricky so qualifying will be important. “It’s been a rollercoaster season – some tough weekends at the start of the year followed by some much stronger results in recent rounds – hopefully we can finish on a high note,” Hill concluded.